Small houses were often built adjacent to churches, sometimes as a residence, most of the time as a shop. Beside the wooden Amstelkerk brick-built annexes have been constructed, a strange combination. Particularly as the annexes have, in contrast to the church, gabled roofs. 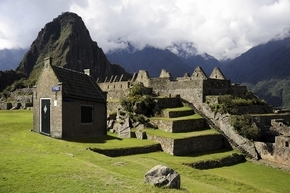 In that respect they fit in much better with 15th century Inca-constructions than with the white church on Amstelveld.